"Nistru" redirects here. For the village in Maramureş County, Romania, see Tăuţii-Măgherăuş. "Nistria" redirects here. For the village in Neamţ County, Romania, see Boghicea. The Dniester River, or Dnister River (/ˈniːstər/ NEES-tər; Romanian: Nistru, Ukrainian: Дністе́р translit. Dnister, Polish: Dniestr, Russian: Днестр, Turkish: Turla) is a river in Eastern Europe. It runs first through Ukraine and then through Moldova (from which it separates the breakaway territory of Transnistria), finally discharging into the Black Sea on Ukrainian territory again. The name Dniester derives from Sarmatian dānu nazdya "the close river." 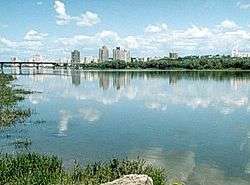 The Dnieper, also of Sarmatian origin, derives from the opposite meaning, "the river on the far side". Alternatively, according to V. Abaev Dniester would be a blend of Scythian dānu "river" and Thracian Ister, the previous name of the river, literally Dān-Ister (River Ister). The Ancient Greek name of Dniester, Tyras (Τύρας), is from Scythian tūra, meaning "rapid." The names of the Don and Danube are also from the same Proto Indo-European word *dānu - river. In Russian, it is known as Днестр, translit. Dnestr, in Yiddish: Nester נעסטער; in Turkish, Turla and during antiquity, it was called Tyras in Latin and Danastris in Greek. Classical authors have also referred to it as Danaster. These early forms, without -i- but with -a-, contradict Abaev's hypothesis. Edward Gibbon refers to the river both as the Niester and Dniester in his History of the Decline and Fall of the Roman Empire. 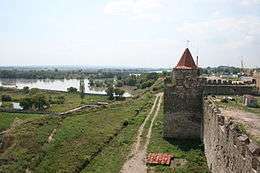 Dniester's riverhead in Staryi Sambir (western Ukraine). 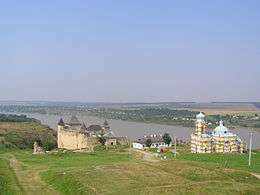 The Dniester rises in Ukraine, near the city of Drohobych, close to the border with Poland, and flows toward the Black Sea. Its course marks part of the border of Ukraine and Moldova, after which it flows through Moldova for 398 kilometres (247 mi), separating main territory of Moldova from its breakaway region Transnistria. 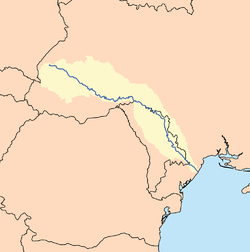 It later forms an additional part of the Moldova-Ukraine border, then flows through Ukraine to the Black Sea, where its estuary forms the Dniester Liman. The Dniester in Khotyn (southern Ukraine). Another Moldavian fortress and an Orthodox church seen on foreground. During the Neolithic, the Dniester River was the centre of one of the most advanced civilizations on earth at the time. The Cucuteni-Trypillian culture flourished in this area from roughly 5300 to 2600 BC, leaving behind thousands of archeological sites. Their settlements had up to 15,000 inhabitants, making them the first large farming communities in the world, long before Mesopotamian cities. In antiquity, the river was considered one of the principal rivers of European Sarmatia, and it was mentioned by many Classical geographers and historians. According to Herodotus (iv.51) it rose in a large lake, whilst Ptolemy (iii.5.17, 8.1 &c.) places its sources in Mount Carpates (the modern Carpathian Mountains), and Strabo (ii) says that they are unknown. It ran in an easterly direction parallel with the Ister (lower Danube), and formed part of the boundary between Dacia and Sarmatia. It fell into the Pontus Euxinus to the northeast of the mouth of the Ister, the distance between them being 900 stadia – approximately 130 miles (210 km) – according to Strabo (vii. ), while 130 miles (210 km) (from the Pseudostoma) according to Pliny (iv. 12. s. 26). Scymnus (Fr. 51) describes it as of easy navigation, and abounding in fish. Ovid (ex Pont. iv.10.50) speaks of its rapid course. Greek authors referred to the river as Tyras (Greek: ὁ Τύρας). At a later period it obtained the name of Danastris or Danastus, whence its modern name of Dniester (Neister), though the Turks still called it Turla during the 19th century. The form Τύρις is sometimes found. From the 14th century to 1812, part of the Dniester formed the eastern boundary of the Principality of Moldavia. Between the World Wars, the Dniester formed part of the boundary between Romania and the Soviet Union. In 1919, on Easter Sunday, the bridge was blown up by the French Army to protect Bender from the Bolsheviks. During World War II, German and Romanian forces battled Soviet troops on the western bank of the river. At the confluence of the Seret and the Dniester. The Stryi River is one of the Dniester's tributaries. Tributaries on the east side are the Răut River, the Ikel River, the Bîc River, and the Botna River. Tributaries on the west side are Zolota Lypa River (140 kilometres (87 mi)), Koropets River, Strypa River, Dzhuryn River, Seret River (250 kilometres (160 mi)), Zbruch River (245 kilometres (152 mi)), Smotrych River (169 kilometres (105 mi)), Ushytsia River (112 kilometres (70 mi)), Kalius River, Liadova River, Murafa River (162 kilometres (101 mi)), Rusava River, Yahorlyk River (173 kilometres (107 mi)), and the Kuchurhan River (123 kilometres (76 mi)). ↑ Mikhail Widejko. "Trypillya Culture Proto-Cities: History of Discovery and Investigations © M. Yu. Videiko Published: Відейко М. Ю. Трипільські протоміста. Історія досліджень. Київ 2002; с. 103–125 (Videiko M. Yu. Trypillya culture proto-cities. History of investigations. Kiev 2002, p. 103–125)". Iananu.kiev.ua. Retrieved 2012-08-23. ↑ Herod. iv. 11, 47, 82; Scylax, p. 29; Strab. i. p. 14; Mela, ii. 1, etc. ; also Schaffarik, Slav. Alterth. i. p. 505. ↑ Stephanus of Byzantium, p. 671; Suid. s. v.
Wikimedia Commons has media related to Dniester. Volodymyr Kubijovyč, Ivan Teslia, Dnister River in the Encyclopedia of Ukraine, vol. 1 (1984).